The Intermec EasyCoder 3240 has been discontinued. No direct replacement is available. Printing small labels for electronic components, printed circuit boards, test tubes and vials can be challenging for rival label printers. With the EasyCoder 3240, however, it's a snap due in part to two important technologies: 406 dpi print resolution and Intermec's patented PrecisionPrint technology for perfect label-to-label image resolution. 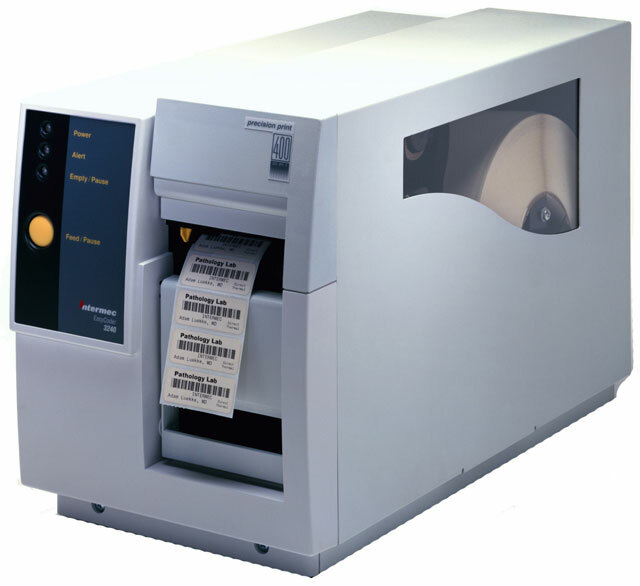 In addition to printing on small or oddly shaped labels, the EasyCoder 3240 is perfect for printing on a variety of difficult to print on substrates, such as Kaptron or ultra-smooth polyesters and synthetics. That's why so many organizations in electronics, pharmaceuticals, telecommunications and health care have turned to Intermec for printers. All units ship with product documentation. Includes Intermec LabelShop START barcode label design software. Thermal transfer, 406 dpi, 4 ips, 2.5" print width, Ethernet & serial interfaces, 128KB NVRAM. Includes US power cord. Order cables separately. See accessories. Thermal transfer, 406 dpi, 4 ips, 2.5" print width, parallel & serial interfaces, 128KB NVRAM. Includes US power cord. Order cables separately. See accessories. Thermal transfer, 406 dpi, 4 ips, 2.5" print width, serial interface, 128KB NVRAM. Includes US power cord. Order cables separately. See accessories.